Battle Creek Enquirer Digitized Images Strikes Again! I don't think of myself as having a lot of research to do in my hometown of Battle Creek, Michigan, but a recent visit to the Helen Warner Branch of Willard Library proved me wrong. I found quite a few newspaper articles on my Glover side of the family in the library's digitized newspapers. Barbara Elaine Glover is my first cousin, once removed. She is the daughter of Merle McKinley Glover and Genevieve Dout. 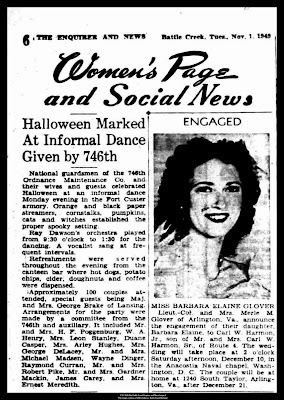 Although, Barbara was to be married in Virginia her engagement announcement was published in the Battle Creek Enquirer. Barbara's aunt, Adeline Glover Tyson McKie, and her grandmother, Hattie Fenn Glover, lived in Battle Creek. 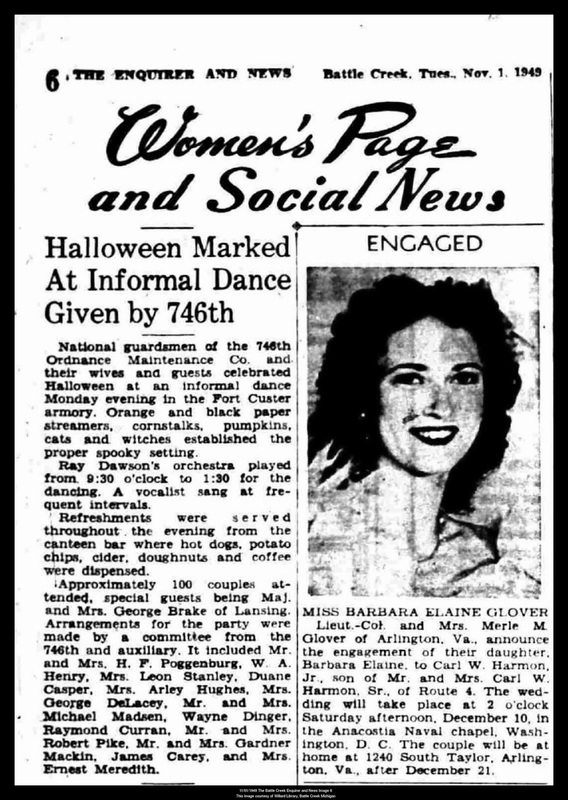 Source: Women's Page and Social News-Engaged, Battle Creek Enquirer, Battle Creek, Calhoun, Michigan, United States, 1 November 1949, page 6; column 2. Lieut.-Col. and Mrs. Merle M. Glover of Arlington Va. announce the engagement of their daughter, Barbara Elaine to Carl W. Harmon, Jr. son of Mr. and Mrs. Carl W. Harmon, Sr. of Route 4. The wedding will take place at 2 o'clock Saturday afternoon, December 10, in the Anacostia Naval chapel, Washington, D.C. The couple will be at home at 1240 South Taylor, Arlington, Va. after December 21. George B. Fenn, the son of Daniel C. Fenn and Elizabeth Ann (Poor) Fenn was born 24 December 1860, in Michigan. He died 11 Dec 1935 in Hersey, Osceola, Michigan, at the age of 75 years. George B. Fenn is buried in the Fenn Family Plot in Hersey Village Cemetery, Hersey, Osceola, Michigan.